Join us for the 12th Annual Breast Cancer Benefit Ride! Two Wheels or Four! Everyone Welcome! $10 per person Meet at Hamilton HD for registration from 10:30a-11am. Ride begins at Noon. 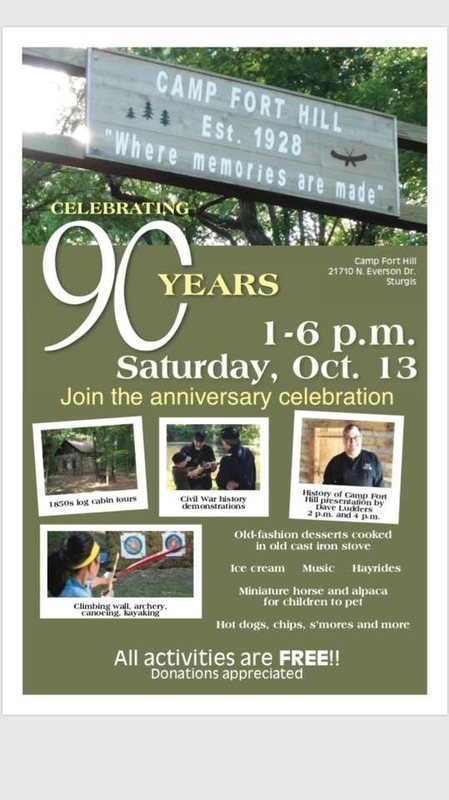 Games, Door Prizes, Live & Silent Auctions Ends at Sturgis Eagles Rain or Shine! Alumni are invited back to play against the high school teams in a fun and unique match! 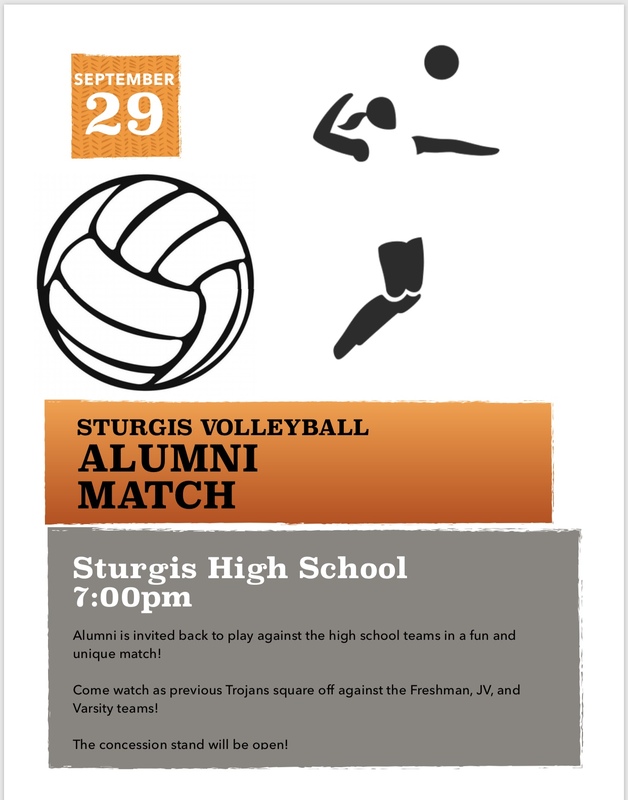 Come watch as Sturgis Volleyball Alumni go head to head with our 2018 Freshman, JV and Varsity teams! Concession stand will be available! 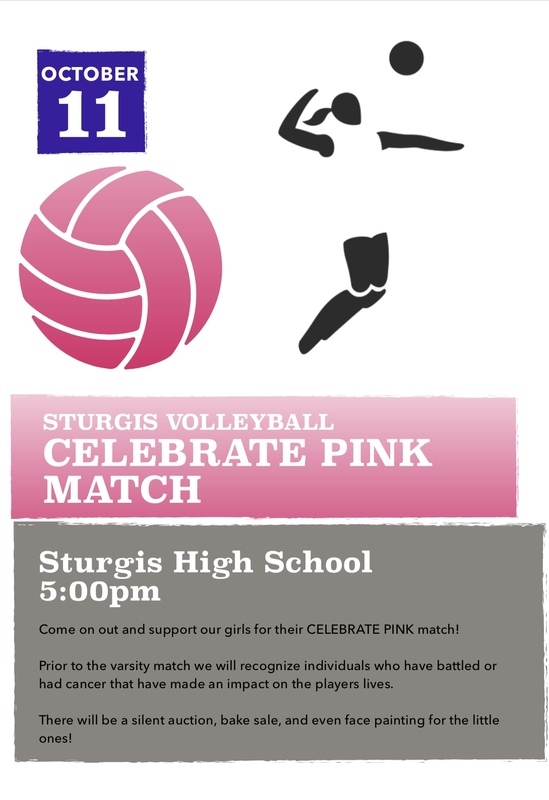 Come on out and support our girls for their Celebrate Pink match! Prior to the varsity match we will recognize individuals who have battled or had cancer that have made an impact on the players lives. There will be a silent auction, bake sale, and even face painting for the little ones! Many vendors: Mary Kay. Premier Jewelry, 31, Tupperware, LuLaroe, Pampered Chef, Matson Designs, Tastefully Simple, wood crafts, stained glass, baked goods, Partylite, doTerra, and more soup and salad meal plus dessert for purchase. 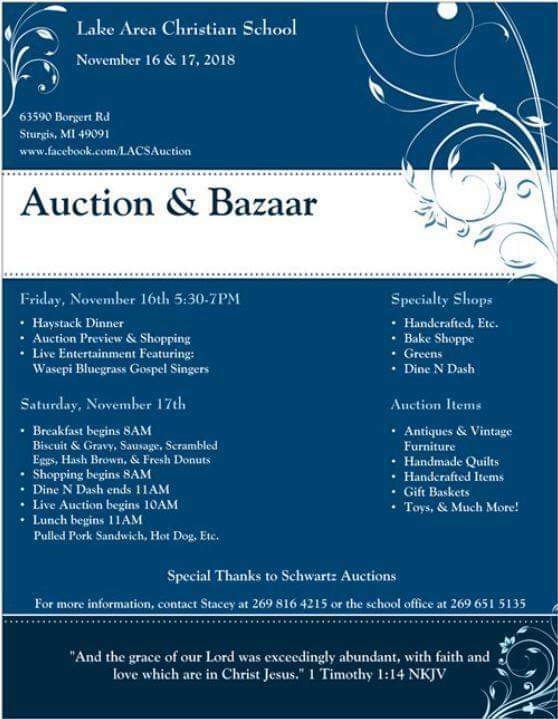 Vendors will be donating part of their proceeds to the church. Benefit dinner/breakfast fundraiser and auction. Live music by Wasepi bluegrass. 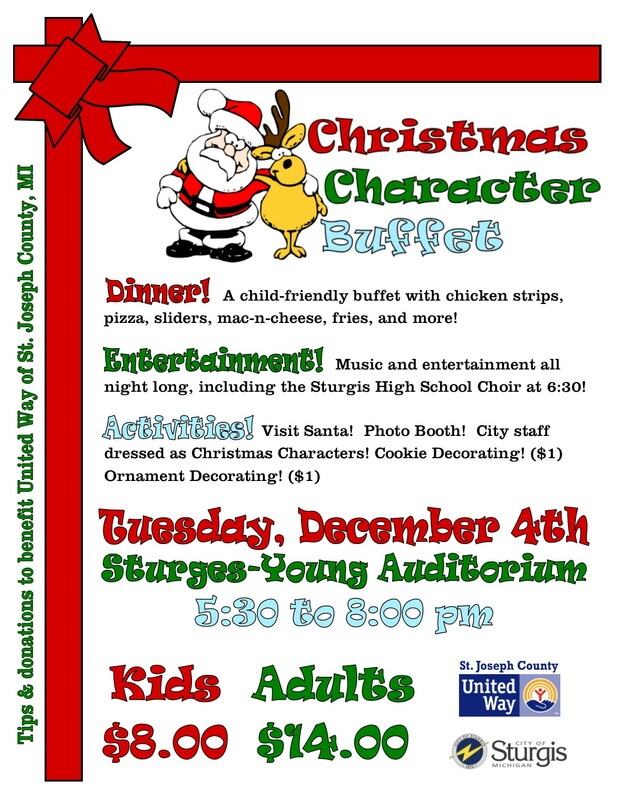 The City of Sturgis is hosting a Christmas Character Dinner at the Sturges-Young Auditorium. 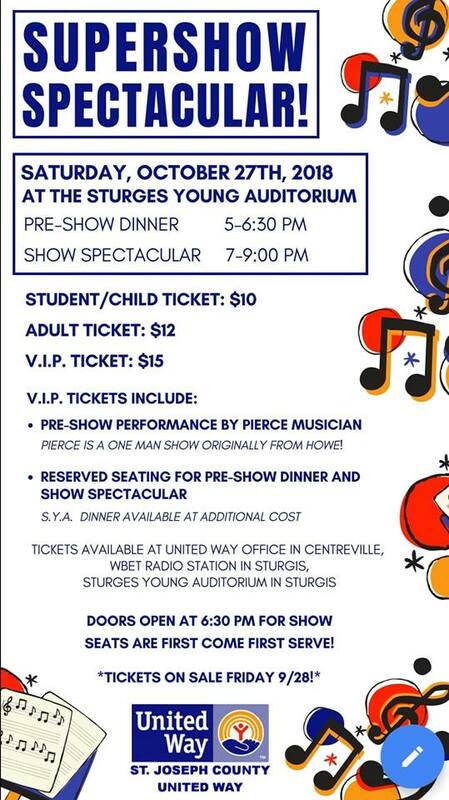 The dinner is a fundraiser for the St. Joseph County United Way. The dinner is a kid friendly buffet style dinner. City staff and other local celebrities will be dressed as their favorite Christmas Characters. Stop out to see Santa Claus, decorate ornaments, decorate cookies, take pictures with your favorite character, and enjoy some Christmas carols from the Sturgis High School Choir! Tickets are available at City Hall and the United Way office. Adults are $14 and children are $8. This includes dinner and soft drinks. All tips and proceeds from this event benefit the St. Joseph County United Way! A great way to kick-off the New Year! 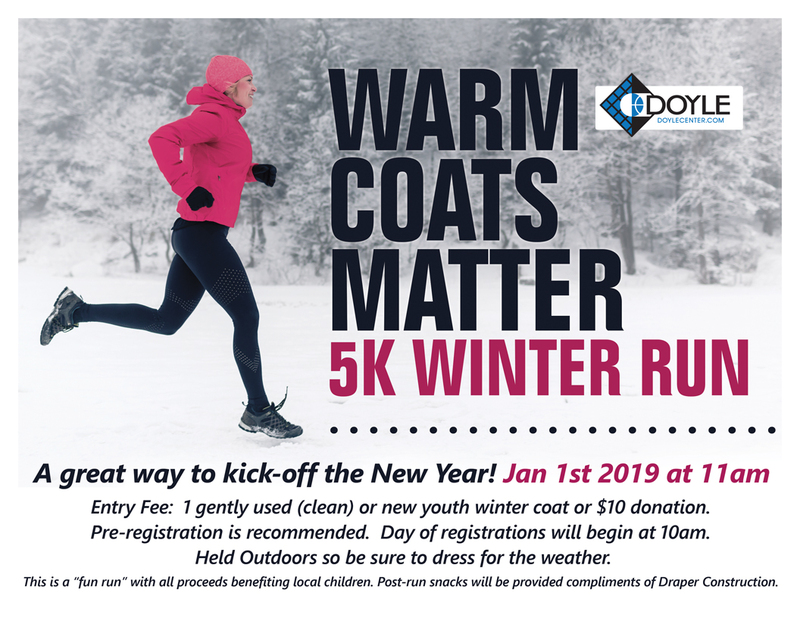 Entry Fee: 1 gently used (clean) or new youth winter coat or $10 donation. Pre-registration is recommended. Day of registrations will begin at 10am. Held Outdoors so be sure to dress for the weather. This is a "fun run" with all proceeds benefiting local children. Post-run snacks will be provided compliments of Draper Construction. Doors open at 6:00. 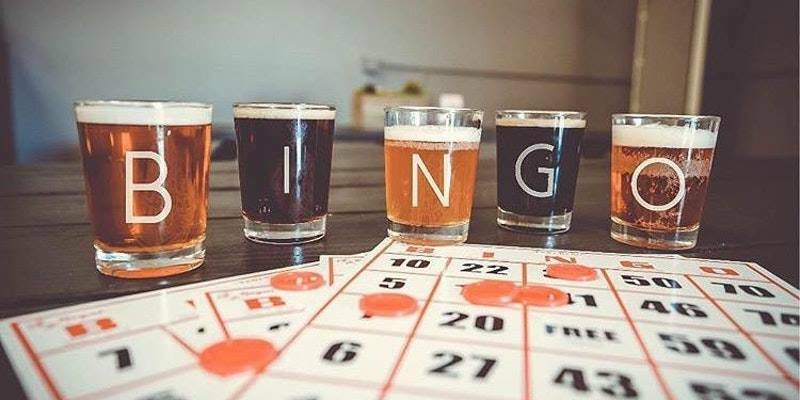 Bingo is at 7:00. Drinks available for purchase at American Legion Bar. Parking on west side of American Legion building and BEHIND Advanced Auto Parts. Supports SHS Caring Closet, Camp Fort Hill, and Family Catastrophic Fund.